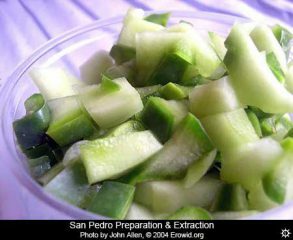 So you bought your first San Pedro cutting, what now? Here at the Magic Mushroom Shop, we have a lot of customers asking us about San Pedro, and the psycho active alkaloid Mescaline. 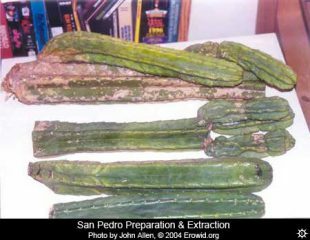 Reading about the San Pedro history, current use and effects made you eager to explore. 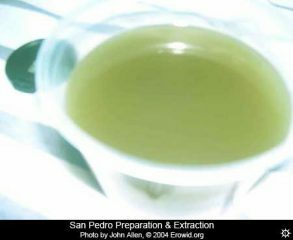 Now you're ready to dive a little deeper, into the methods of mescaline extraction. Well, say no more. Let's go! 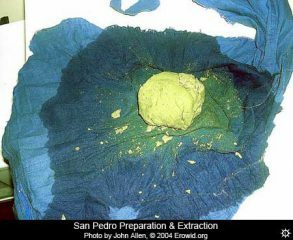 Before we start this step-by-step guide for the filter cloth method, it's important to know that there are several methods for mescaline extraction. Some more complex than others. The filter cloth method is a very straight forward, easy to understand method that can be done with equipment that probably everyone has at home. 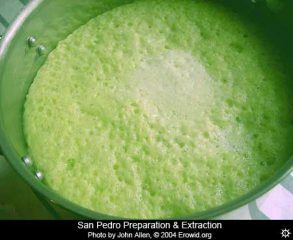 Items used in the preparation of San Pedro include a blender, an 8-quart cooking pot, a spoon or wooden spatula, two empty potato salad containers (equal size) and some clean cloth used for straining. 1. 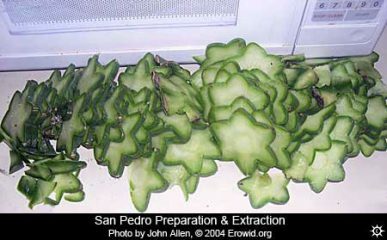 The process starts with a one-foot section of a Trichocereus pachanoi cactus. One foot (or 12 inches) yields a single dose. 2. 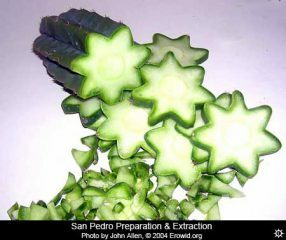 The end of the cactus is shaped like a star, usually with four to nine ribs. 3. 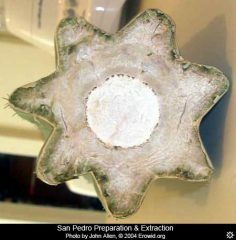 The one-foot section of cactus is sliced like a cucumber into star sections. 4. The star sections are then further cut into quarters so they will fit in the blender. The spurs (spines, needles) can be left on the cactus as the boiling process softens them into string-like pieces of material that can be discarded. 5. 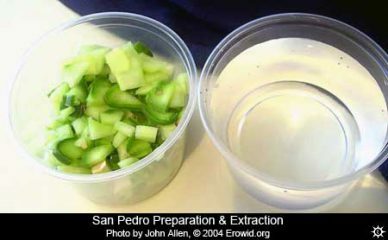 A portion of the cactus chunks are put in one container and an equal amount of water is put into another. 6. The cactus chunks and water are poured into a blender. 7. 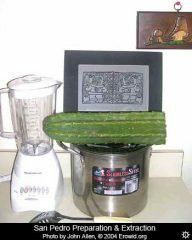 This mixture is blended until the cactus bits and water expand to the top of the blender. After it is blended, the resulting mixture is poured into a large 3-5 quart pot. 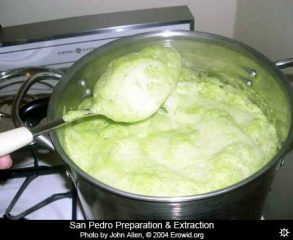 This process is repeated until the whole cactus has been liquefied and poured into the pot. 8. 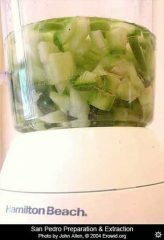 The blended cactus/water mixture is cooked slowly on low heat until the mixture is even, approximately 30 minutes. 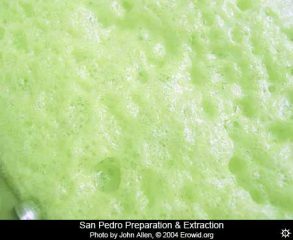 Initially, the cactus pulp separates from the water and sits on top of the liquid. 9. 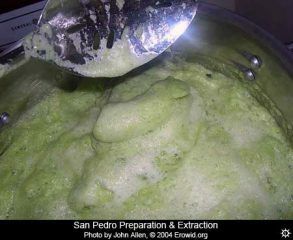 As the mixture cooks, the pulp will rise to the top of the pot, forming a foam that may spill over. A gas stove is preferred as it allows better regulation of the cooking temperature. 10. 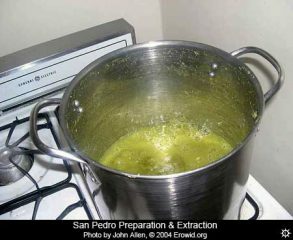 As the mixture continues to cook, it re-combines into one liquid and begins to turn green like the skin of the cactus. During this time, it needs to be stirred. Low heat and stirring are especially important during this first half hour of cooking. 11. 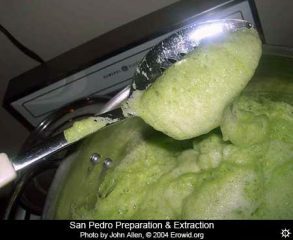 Slowly over time, the pulpy green goop remixes with the water until it reaches the consistency of glue or snot. 12. 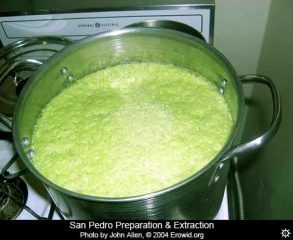 After the water and pulp have rejoined, the heat can be increased slightly allowing the liquid to simmer (a light boil) continuously but without boiling over onto the stove. 13. 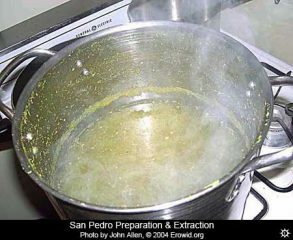 The mixture is allowed to boil lightly for two to four hours until 12 to 16 ounces of goo left are left in the bottom of the pan. 14. During the 2-4 hour period of boiling the mixture needs to be monitored closely to avoid burning. Another 12 to 16 ounces of water or more may be added to prolong the boiling period. Eventually the mixture becomes a messy glob of gooey gluey goop. 15. 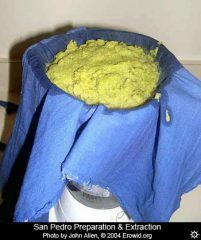 A clean piece of natural-fiber cloth (a piece of a t-shirt is being used in the photo) is placed over the top of the blender, forming a pocket that acts as a filter. 16. The mixture is poured from the pot into the cloth. The liquid slowly seeps through the cloth and drips into the blender. 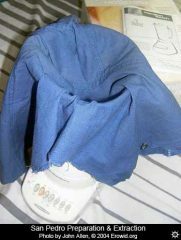 The pulp material is caught in the cloth pocket. This process is repeated until all of the pulp has been poured into the filter cloth. 17. A piece of string is used to tie the top of the cloth closed around the pulp. 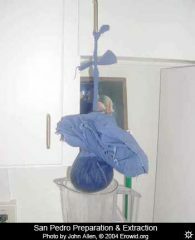 The bag of pulp is suspended over the blender allowing the juice to drain from the pulp, through the cloth, into the blender. 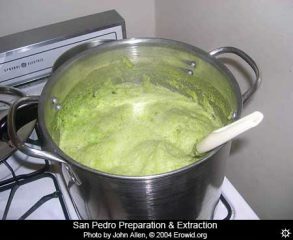 After fifteen minutes, when the cactus pulp has cooled down considerably, the remaining liquid is squeezed by hand from the bag into the blender. 18. The liquid is cooled for a short time until it reaches a temperature that won't burn the mouth or throat.Opening the t-shirt reveals the remaining pulp. Since the psychoactive components have already been extracted from this material, it is discarded. 19. 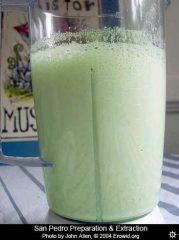 Finally, the juice from the blender is poured into a cup. We want to thank Erowid for creating this guide. And hopefully this will help you with the process of mescaline extraction.